Here is a photo of the main table setup. See the bear climbing up onto the centerpiece. My BFF wanted the manzanita tree sideways. These are NOT the boxes I ordered from Etsy. They never arrived. 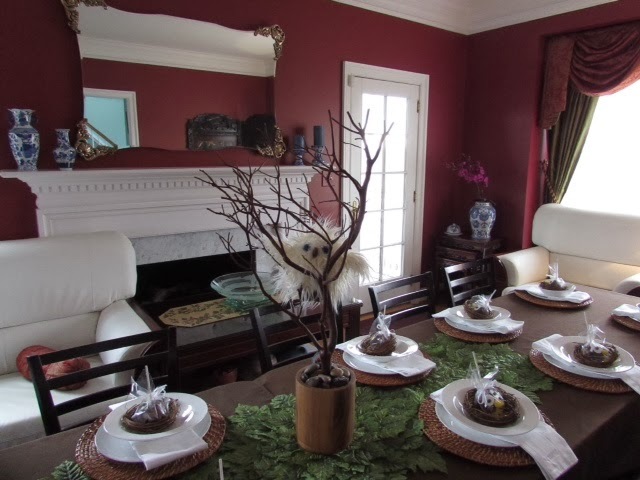 So, if you look carefully, you will see my Christmas centerpiece minus the candles with more pinecones. 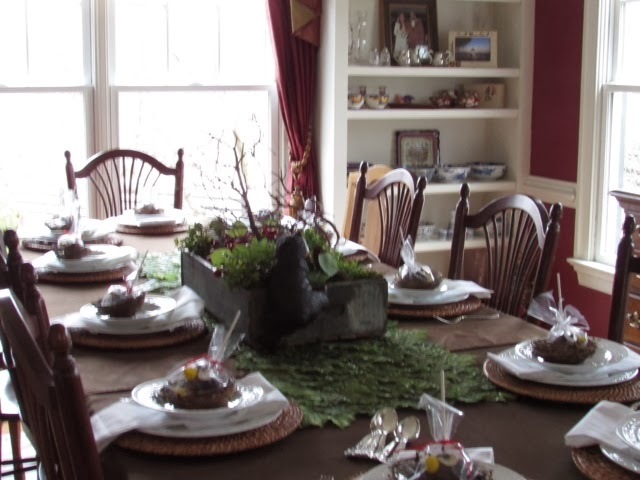 The brown tablecloths made the tablescapes look so rich and comforting on this very cold day. 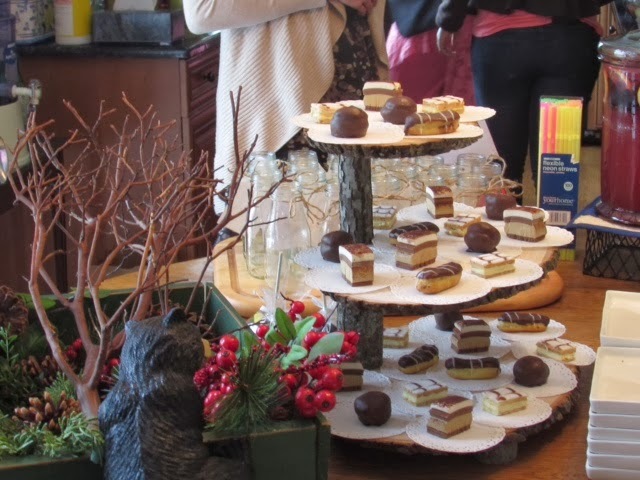 The owl cake pops in the nests were a big hit. 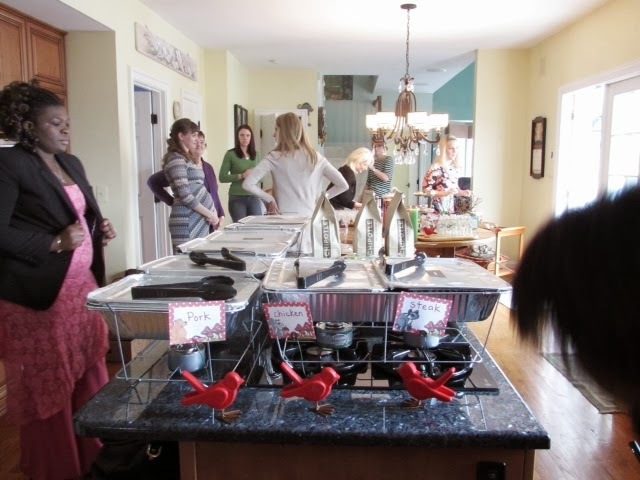 The second long table was too narrow for the duplicate centerpiece. So we used the one we had made for the kitchen display. I bought the wooden vase from Crate and Barrel and filled it up with a jar full of their rocks. We put a Jelly Cat (brand name) Owl in the tree named Olive. I am taking you into the family room show you that BFF left up her Christmas tree for me with the white lights on it. We added grapevine, ivy garland, cranberry sprigs, a mother bear and her three babies climbing it. BFF's two year old grandson thought mama bear was real and wondered if she'd bite him. 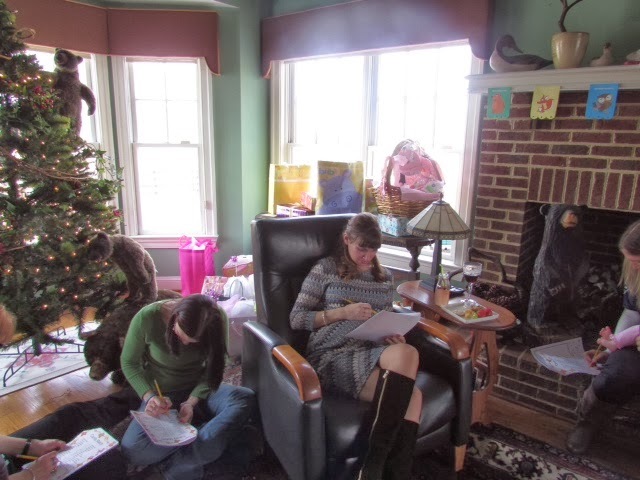 Here also is the mama-to-be in her chair. The chair was right in front of the windows, so many of the photos did not have the correct lighting. She the carved bear BFF has on the hearth. 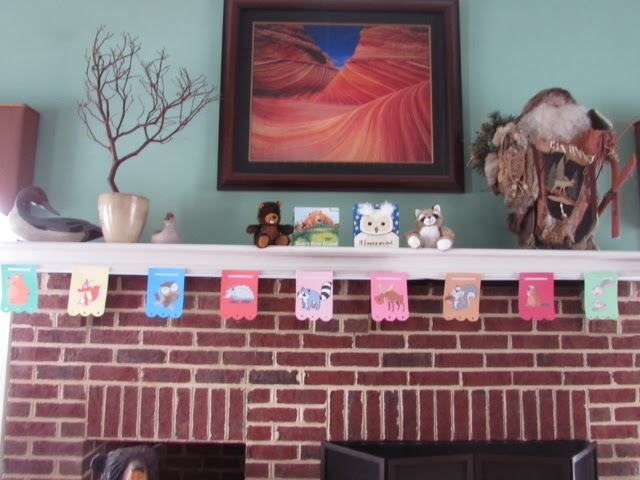 We put the animal banner on the fireplace. 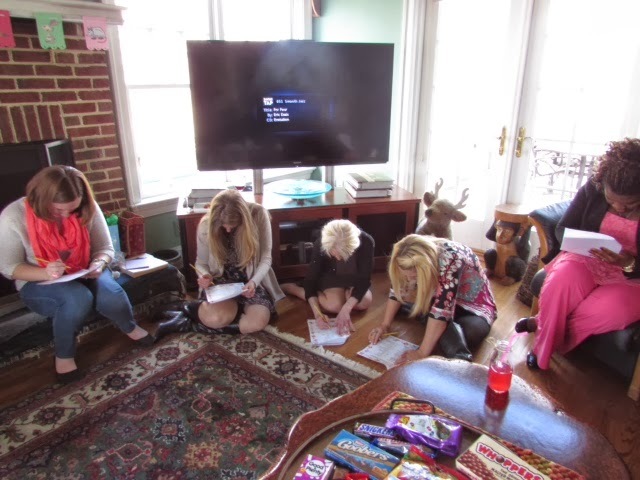 The guests are playing the candy game where you have to match pregnancy related terms to candy. Everyone was so quiet and busy while trying to figure this one out. Here are the ANSWERS: 1H, 2Q, 3R, 4I(i), 5L, 6W, 7K, 8E, 9P, 10S, 11V, 12C, 13B, 14D, 15T, 16N, 17O, 18G, 19M, 20U, 21A, 22J, 23F. 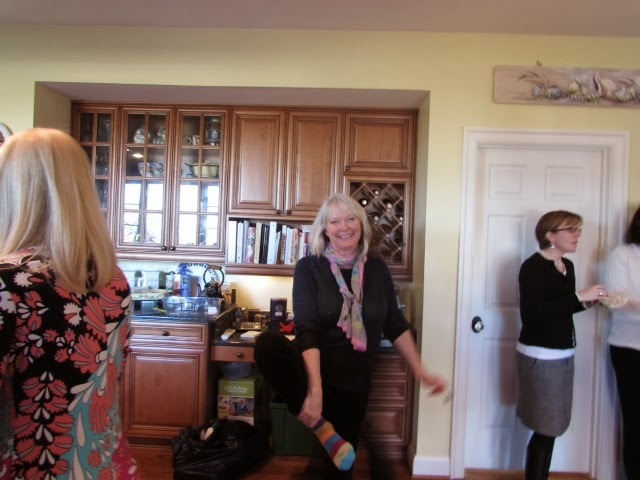 We set up the Chipolte's food on her kitchen island and used her table for drinks and desserts. Here is the second centerpiece with the tiered log display stand I got on Etsy. I got these little finger sized desserts in the frozen section at Costco. They were yummy. 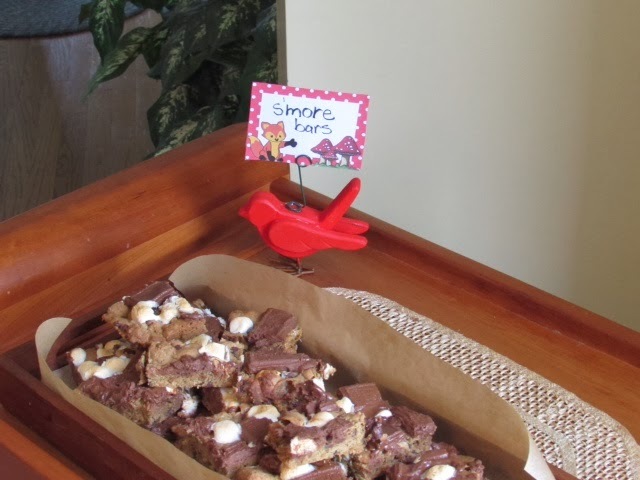 I baked s'more cookie bars using two Pinterest recipes combined. I crushed the graham crackers in food processor and added them right into the dough--along with Hershey's chunks AND mini chips. They baked for 20 minutes. Halfway through the cooking, I added pieces of a two Hershey candy bars and even more mini marshmallows for the last ten minutes. I only had a few left. 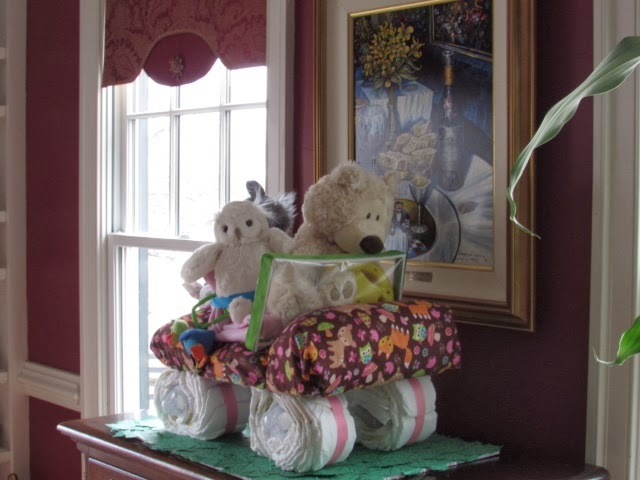 Here sits the diaper jeep on display. She was so tickled with this. I wrapped up the extra diapers from a box of 144, along with extra receiving blankets and a wipable bib. 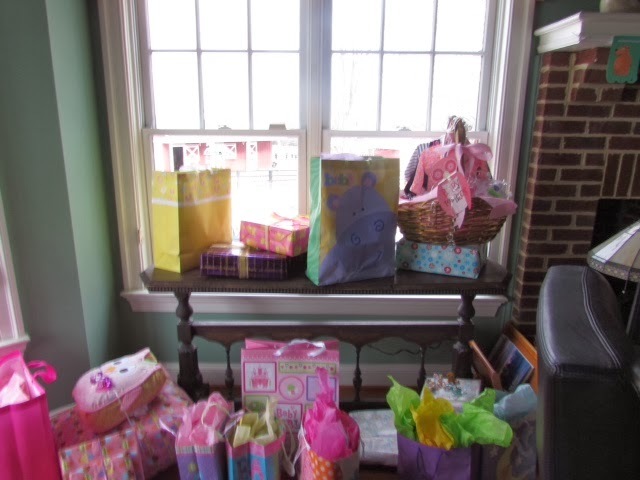 Pictured here are lots of new things for the baby. I wanted you to see the cute basket on the right. One of Anya's friends hung baby clothes from hangers onto the handle. 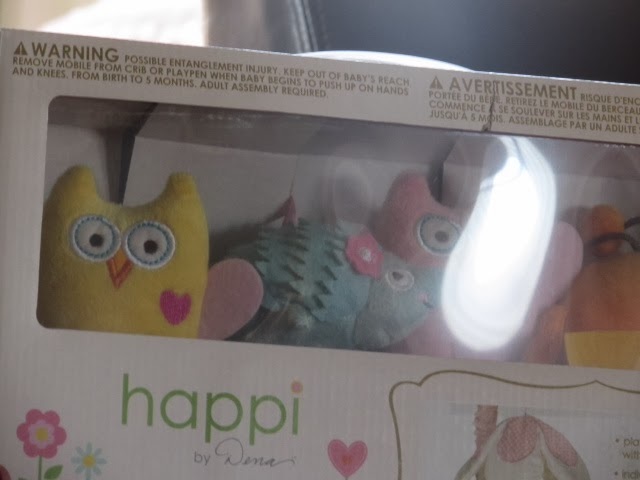 She made a cute owl card and filled the basket with things a baby needs. What do baby's need? Why onsies, of course. And great grandmas to love them. 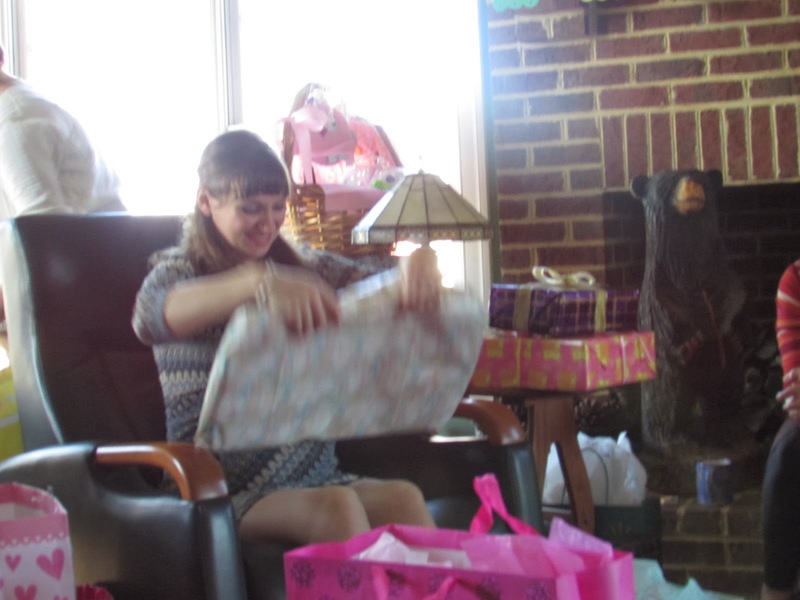 We even had a mystery present none of us could figured out what it was. 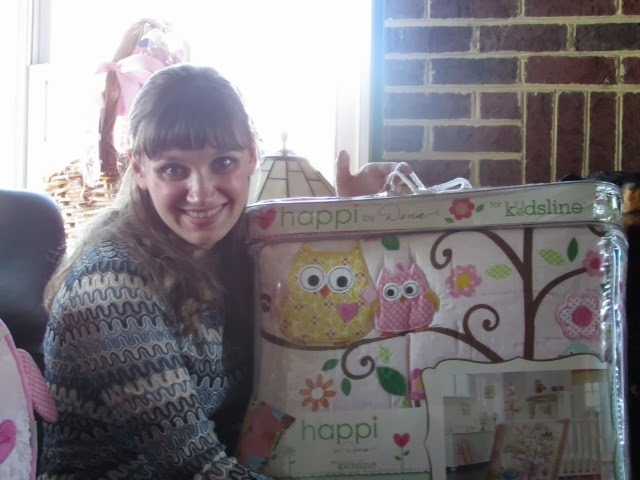 We had to call the gift giver (who left a little early with her three month old). It was a pad you velcro around the baby carrier's handle to make it easier to hold. Who knew? We Google it. Stop laughing. 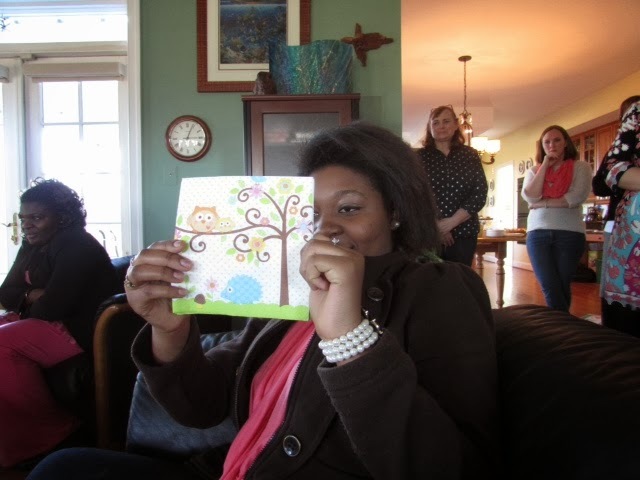 Here is one of her friends holding up the napkins I chose for the dessert table. They had matching plates. 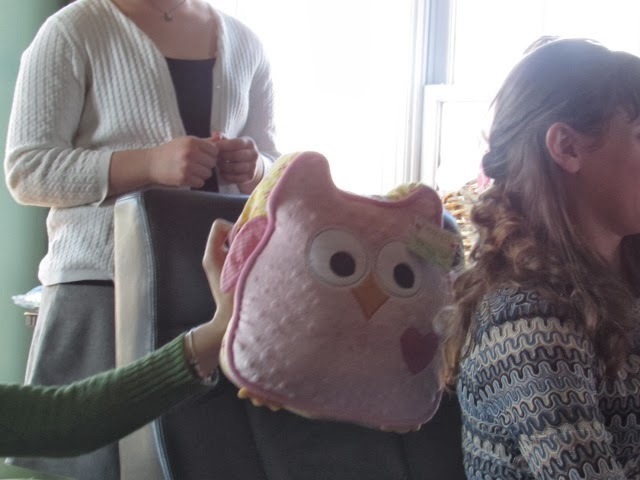 Here is the baby blanket one of her friends gave her. It is the same pattern. Co-incidence? Or scary? You choose. The fourth manzanita branch. You can see the banner better. I gave her two books. "Bear Makes a New Friend" (an owl) and "If I Were an Owl." The baby beaver and raccoon are for her diaper bag. Does my friend look happy. 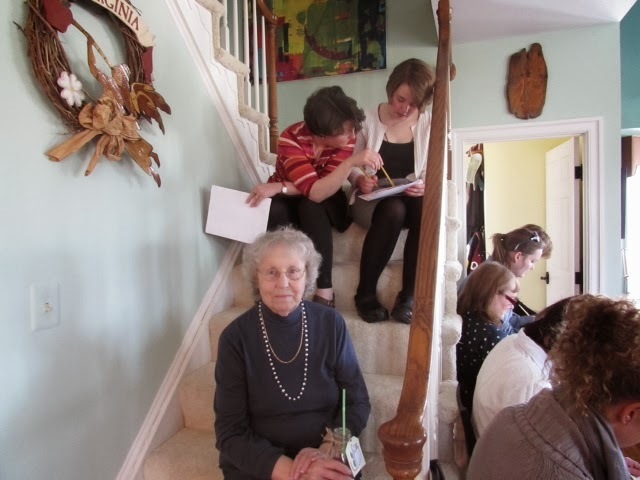 This will be her fourth grandchild. She's getting pretty good at being someone they can love. If you'd like to see how I did all of this, go here. 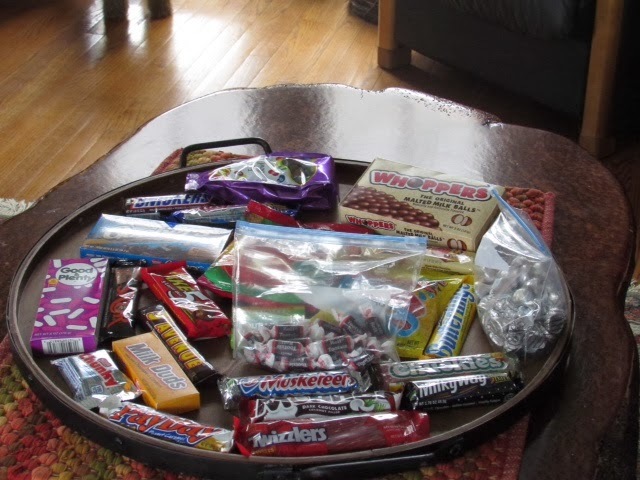 DO you have the answers to the candy game still? 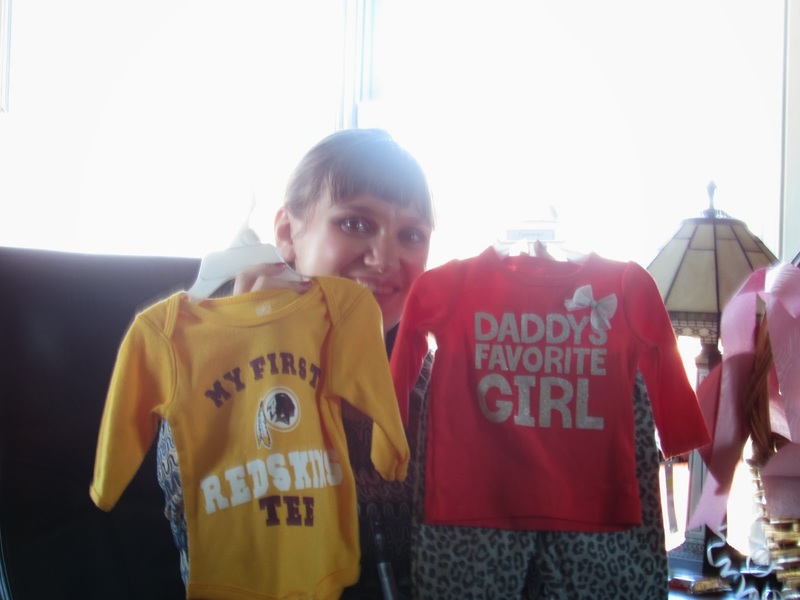 I have update the post with the answers to the baby game. I hope you enjoy playing it. 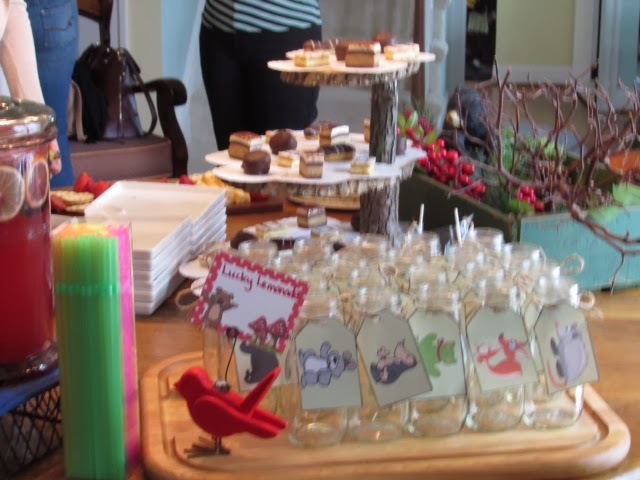 We hit JoAnn Fabrics in Virginia area for a lot of the candy, along with Michael's to get individual pieces.